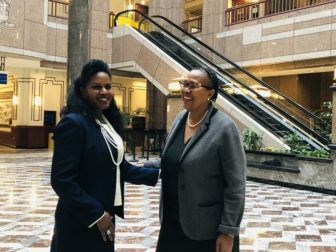 The appointments of Renée D. Coleman-Mitchell, left, as public health commissioner and Sibongile “Bongi” Magubane, right, as head of the motor vehicles department, were confirmed by a legislative committee Tuesday. Three critical gubernatorial appointments – for head of the state’s department of motor vehicles, commissioner of public health and leader of the agriculture department – easily cleared the legislature’s joint committee on executive and legislative nominations Tuesday. Lawmakers approved the nominations of Sibongile “Bongi” Magubane, Renée Coleman-Mitchell and Bryan Hurlburt, saying they were impressed with the candidates’ resumes and optimistic about the direction of each department. Bryan Hurlburt also was confirmed as agriculture commissioner.